The Office of Lord-Lieutenant is steeped in history. The office had its origins in the needs of the Tudor monarchs to strengthen their military forces against possible invasion from France or Spain and to guard against internal revolt. Lieutenants were first created by Henry VIII in 1545 to muster the county militias for the defence of the realm. They had powers to lead the militia in the field and to raise forces locally. The Lord-Lieutenant’s role was literally to ‘stand in for’ The King, in the battlefield and elsewhere. Important parts of the role were to act as an unpaid recruiting sergeant for The King and·to play a major part in keeping law and order by both appointing and managing magistrates. The Lord-Lieutenant was also responsible for looking after state documents in his county and informing The King of what was going on. From 1569 Lord-Lieutenants could appoint Deputy Lieutenants to assist them in this role. However it was not until 1586 when Queen Elizabeth I, in the light of invasion threats from Spain, appointed Lord-Lieutenants more widely. By the time the Spanish Armada arrived on our shores in 1588, Lord-Lieutenants had been appointed in almost every County. 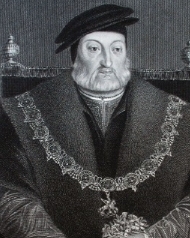 The first Lord-Lieutenant of Berkshire - and indeed of 11 other counties in the South of England - was Charles Brandon, Duke of Suffolk, a brother-in-law of Henry VIII. Unfortunately he survived his appointment by only two months and is buried in St. George’s Chapel, Windsor. The role of the Napoleonic Wars at the end of the eighteenth and beginning of the nineteenth century saw the last high point of militia activity in the County of Berkshire – in 1792 the Berkshire militia was called out for home defence and in subsequent years they helped to defend the South coast of England, playing a role until the defeat of Napoleon in 1815. Thereafter the military role of Lord-Lieutenants subsided until control of the militia, yeomanry and voluntary forces was removed from the Lord-Lieutenants in 1871; in 1921 they finally lost the power to raise any sort of local force. • They are The Queen’s representative in the county, and from that flows much of what they do – including as necessary acting as her eyes and ears. • Links with the military remain strong and important – mainly in an ambassadorial role, but in particular strongly supporting the reserve and cadet forces and major military bases in the county. • The Lord -Lieutenant is Chair of the Magistrates Advisory Committee in Berkshire. This Committee has overall responsibility for the appointment and disciplining of magistrates.